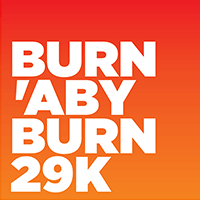 Burn Baby Burn... this 29k to Burnaby is as hot as a Disco Inferno! The Central Valley Greenway is a new bike and pedestrian route billed by Translink as a “major transportation and recreation project that is critical to the healthy future of the region.” Those are mighty big expectations to place upon a mere bike path, so like a 24k-long Field of Dreams, if they’re going to build it, we will run. The Burn’aby Burn 29k route follows 10th Avenue to Victoria Drive where it dog-legs north to link up with the CVG for the journey out to Burnaby Lake Regional Park. The turnaround point is the Burnaby Lake Sports Complex at Kensington Avenue and Joe Sakic Way. The 20-mile Option: If 29k isn’t enough to get you out of bed, first head north on Fir Street and do the 3k out-and-back to the boat launch at the Burrard Marina before heading east. Big thanks to the BRC’s new Burnaby rep, Brian, for scouting out the route!